Plebejinae: a subfamily of »Lycaenidae proposed by Henri »Stempffer in 1937 and adopted by Nabokov. This is the group he did most of his scientific work on. The newer classifications of this group, by »Clench and subsequently by »Eliot, were not yet in sight. According to the list Nabokov drew up at the end of Lep9 (p. 47–48), the Plebejinae consist of 100 to 120 species worldwide that can be grouped into 24 genera, 8 of which Nabokov proposed and named in Lep8 and Lep9. The genus »Lycaeides that Nabokov was particularly concerned with belongs to it, and the South American blues he classified as well. In Lep9 (p. 44), Nabokov imagined a time machine that takes one back into the Cenozoic era. In the Miocene, one would find Asiatic butterflies that could be classified as lycaenids, but the structural group of Plebejinae would still be lacking. Then, in the Palearctic region, some of the basic shapes of that group would show up, something Chilades-, Aricia- and Lycaeides-like. Plebejinae, he says, reached S America before they reached N America; here they may have arrived in the order Icaricia, Plebulina, Plebejus saepiolus, Lycaeides argyrognomon (= idas), Agriades glandon, Vacciniina optilete. Nabokov stressed that the term Plebejinae does not cover "the superficial concept of 'Blues' for which no systematic term or division can exist" (Lep8 104). In his notes for "The Butterflies of Europe" (1964), he emphasized that the Plebejinae, as he understood them, are not the same as the Plebejinae of authors like Verity (which are a much larger assemblage). However, they are "also equivalent to the tribe 'Plebejidi' or 'Plebeiidi' of Tutt & Chapman, 1909; and to the subfamily Polyommatinae of Forster, 1938. It includes 24 world-wide subgenera [i.e., if the former genera are demoted to subgenera, as Nabokov intended to do], twelve of which are represented in Europe" (Nabokov's Butterflies, p. 605, 607). For a modern way to distinguish this group and the nomenclatorial implications of such a move, see under »Lycaenidae and »Polyommatus Section. Plebejus Kluk, 1802: a genus of »Lycaenidae, subfamily Polyommatinae (blues), tribe Polyommatini, »Polyommatus Section. The name was coined by the Polish priest and zoologist Krzysztof Kluk (1739–1796). The type-species he selected was »Plebejus argus Linnaeus, 1758. Its only N American representative used to be Plebejus saepiolus Boisduval, 1852 until the genus was greatly enlarged by the reformation of the »Polyommatus Section by Bálint and Johnson in 1997. The spelling Plebeius which Nabokov like other authors sometimes used is wrong. It was introduced in 1871 by Kirby who was unaware of Kluk's work, and as a junior homonym of Plebejus is invalid (Hemming, 1967). Two of Nabokov's lepidopterogical papers (Lep19 of 1952 and Lep22 of 1970) loosely suggest an extension of this generic name to a great number of butterfly species which are usually listed under different generic names, also in Nabokov. Such an extension and the name changes it entails must greatly puzzle the reader. What happened is this. As Nabokov made clear for instance in Strong Opinions (p. 320), one of his persistent scientific concerns was to gain recognition for the fact that there is a certain group of lycaenids which share certain morphological characters setting them apart and that this relationship should somehow be reflected by their name. For the most part he was content to see them grouped in the subfamily »Plebejinae as outlined by Henri Stempffer in 1937. This is the way they are treated in all his scientific writings except Lep19 and Lep22. It had no effect on their conventional names. After he had finished his laboratory work, he seems to have become convinced that this group should be made more visible by uniting it into what is called a supergenus, that is a genus which comprises several conventional genera. This supergenus' name was to be Plebejus. "I am perfectly willing to demote the whole of my 'subfamily' Plebejinae to a supergenus or genus Plebejus … but only under the condition that it include exactly the same species, in the same groupings ('subgenera' or numbered sections, as you will) and in the same sequence of groups, without intrusions of groups assigned structurally to other 'subfamilies' …" (Strong Opinions, p. 320; likewise Selected Letters, p. 414). The introduction of a supergenus has an immediate effect on the names. The name of the supergenus becomes the new generic name while the old name is demoted to that of a subgenus, following the new name in parentheses or omitted altogether. Thus what had been Hemiargus isola now would have to become Plebejus (Hemiargus) isola. Such a lengthening of names makes them rather unwieldy. Nevertheless, this is exactly what Nabokov intended to do in his projected The Butterflies of Europe. It was to list all the blues in question in the form Plebejus (Lycaeides) idas (Nabokov's Butterflies, p. 607–8). Nabokov obviously meant to apply his new supergenus Plebejus to the whole of Stempffer's Plebejinae, equivalent to the Polyommatus Section of Bálint & Johnson (1997). In the forties, fifties and sixties, the Plebejinae had a little over 100 species in 24 genera. The Polyommatus Section has grown to over 400 species, mainly through Zsolt Bálint's search in European museum collections and systematic collecting in the Andes of South America. It would have been unpractical to unite them all in one supergenus. So Bálint & Johnson chose a different course. They recognized nine structurally different, hopefully monophyletic groups which they united in nine genera: Agriades, Aricia, Chilades, Madeleinea, Paralycaeides, Plebejus, Polyommatus and Pseudolucia. Plebejus is just one of them. Under this they subsumed the genera Alpherakya, Lycaeides, Maurus, Plebejides and Plebulina, abandoning those generic names altogether. So on the one hand, Nabokov's desire to have the most Plebejus-like species united in one taxon has been fulfilled, and the rest are close by. On the other hand, many of the names under which he knew these insects have disappeared. In his 1945 paper on the South American blues of the Plebejus type (»Lep9), Nabokov ventured to suggest how and in what order they might have arrived in South America. For there was a problem. Some of these blues seemed "older" than those of North America. Assuming that they all must have arrived from the Palearctic via the Bering land bridge, it looked as if those coming first had somehow traversed N America nonstop and made straight for the Andes, without leaving offspring in the north. In Nabokov's time, there was no way of verifying evolutionary speculations of this sort. However, in 2010-11 a group of researchers headed by Roger Vila of the Harvard MCZ came up with DNA mapping data that lent a sound empirical basis to Nabokov's hypothesis. They determined the genetic distances between the different groups of South American Blues. 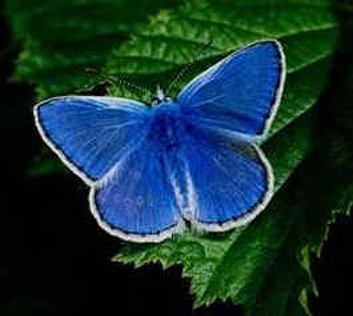 This is what their »paper said: "The radiation of Polyommatus blues in the New World was first appreciated by the famous writer Vladimir Nabokov when he was working as curator in the Museum of Comparative Zoology at Harvard in the early 1940s. Although sometimes described as an amateur, Nabokov was a serious taxonomist who made important contributions to the systematics of the Polyommatus section and revised many of the New World taxa, particularly in the genus Lycaeides. In his most significant paper, published in 1945, Nabokov drastically rearranged the Neotropical taxa, describing seven new genera. Importantly, Nabokov laid out a detailed phylogeographic hypothesis for the New World Polyommatus blues. Nabokov described how 'a modern taxonomist straddling a Wellsian time machine with the purpose of exploring the Cenozoic era’ would encounter the following series of events in the evolution of these butterflies: (i) From Asian ancestors, a first colonization event of the New World across the Bering Strait, followed by dispersal southwards to South America. This first stock would produce the current Neotropical taxa, but would subsequently vanish almost completely from North America. (ii) A second crossing of the Bering Strait made by the ancestors of the Icaricia – Plebulina clade. And finally, more recently, the dispersal of: (iii) Lycaeides, (iv) Agriades and (v) Vacciniina (explicitly in that order) from Asia to North America following the same route." Using DNA mapping data to estimate the genetic distances between the groups of butterflies involved, the researchers arrived at the following conclusion: "Our molecular phylogeny indicates that the New World Polyommatus blues are polyphyletic [that is, that they descend from different ancestors], and constitute five separate invasions: (i) the origin of the Neotropicalclade from Southeast Asian ancestors, which we estimate occurred approximately 10.7 Ma [Megaannum = million years ago]; (ii) the subsequent evolution in North America of the Icaricia–Plebulina clade (including the taxon saepiolus) 9.3 Ma; (iii) the evolution of Lycaeides and its relatives 2.4 Ma; (iv) the evolution of Agriades 1.1 Ma; and finally (v) the evolution of Vacciniina 1.0 Ma. Our results show that Nabokov’s inferences based on morphological characters (primarily of the male genitalia) were uncannily correct in delineating not only species relationships but also the historical ordering of these five key events in the evolution of New World blues." Mind that strictly speaking this is no definite proof of Nabokov's hypothesis. But the results are perfectly compatible with it, which is much. So molecular biology has vindicated Nabokov. Plebejus aegon Denis & Schiffermüller, 1775 [Lycaenidae]: an obsolete synonym of »Plebejus argus Linnaeus, 1758. Plebejus (ex Lycaeides) agnata Staudinger, 1889 [Lycaenidae]: a blue in C Asia and Turkestan which according to Nabokov belongs to the species argyrognomon (today idas) but actually is a distinct species. Plebejus (ex Lycaeides) anna W.H. Edwards, 1861 [Lycaenidae]: today considered as a subspecies, »Plebejus idas anna. Plebejus argus Linnaeus, 1758, syn aegon Denis & Schiffermüller, 1775 [Lycaenidae]: a Palearctic blue with a wingspan of 20–23 mm. In the males, the wings are a very deep, purplish blue. In the females, they are brown with marginal orange spots. It flies over grasslands and heaths from W Europe across temperate Asia and Siberia to Japan. Plebejus argus aegidion Meisner, 1818 [Lycaenidae]: a subspecies of the Silver-studded Blue, at high altitudes in the Alps. "More of an environmental, altitudinal form … than a regular subspecies especially as it is repeated pretty exactly in Lappland and Arctic Russia." Plebejus argus corsica Bellier, 1862 [Lycaenidae]: a subspecies of the Silver-studded Blue, in Corsica and Sardinia, described from Bastelica in Corsica. "As with many Corsican subspecies (cp. »P[lebejus] idas bellieri) this is one of the most striking of the species." Plebejus argus orientalis Tutt, 1909 [Lycaenidae]: an eastern subspecies of the Silver-studded Blue, described from Asia Minor. Roger Verity says it corresponds to his race tuscanica Verity, 1919, described from Tuscany. As both varieties are lacking in all modern manuals, they seem to have been synonymized under argus and as names become extinct. Plebejus (ex Lycaeides) argyrognomon Bergsträsser, 1779, Tutt, 1909 [Lycaenidae]: This used to be considered a Holarctic species of blues, present in Eurasia and in N America. In 1954, however, by a ruling of the International Commission for Zoological Nomenclature, the Holarctic species became idas while the name argyrognomon was reserved for a strictly Palearctic one that before had been known before under various names, mainly ismenias Meigen, 1829. (Bergsträsser in 1779 had called the same butterfly not only argyrognomon but also argyrocapelus, argyrocopus, argyrophylax, argyrobius ‒ all his names reflect the silver. Further synonyms were bellofontanensis Stempffer, 1928 and septentrionalis Beuret, 1928.) The name ismenias had to go because it was an invalid homonym. The name idas had been coined by Linnaeus in 1761, though it is unclear for exactly what butterfly it had been intended. The reason for this nomenclatorial maneuver was the sorry fact that Jacob »Hübner had misidentified the specimen he founded the genus Lycaeides on. In detail, the ruling of the I.C.Z.N. (Opinion no. 269) that put an end to the confusion stated that (1) figure 23 on plate 8 in a 1917 paper by Reverdin & Chapman was illustrating the genitalia of L. argyrognomon, (2) that figure 1 on Plate 20 in Tutt, British Lepidoptera, vol. 10, 1909, was illustrating the genitalia of Plebejus argus and (3) that figure 7 on Plate 3 in Oberthür, Études de Lépidopterologie comparée, vol. 14, 1889, was illustrating the genitalia of Lycaeides idas. In a letter to William D. »Field, Supervisor of Lepidoptera at the Smithsonian Institution (May 25, 1972), Nabokov gave the most succinct account of the misfortune that had befallen this species. He said the time had come to straighten out "the unfortunate nomenclatorial confusion which has resulted from American lepidopterists' ignoring the change of two specific names in Lycaeides (Int. Comm. Zool. Nom, 1954). Since the time I wrote about that subgenus (see Bull. MCZ vol. 101, Feb. 1949) the name of the short-falx Holarctic species, which I and others used to call 'L. argyrognomon (Bergstr., Tutt),' has been changed to 'L. idas (L),' whilst the name 'L. argyrognomon (Bergstr.)' has been shifted to the long-falx Palearctic species, which I and others used to call 'L. ismenias (Meigen).'" Hence today in Europe and Asia there are both idas and argyrognomon, differing mainly in the length of their falx (that is, a sickle-shaped structure of the male genitalia). In America there is just one of them, idas. To the naked eye both look more or less the same; moreover, they are quite similar to »Plebejus argus. The wingspan of both species is 22–32 mm, peaking between 28 and 30. The males are a bright silvery violet-blue with narrow black margins and white fringes, the females are brown, with orange lunules along the borders. Today's argyrognomon is found from the Pyrenees through most of S and C Europe, N to S Scandinavia and E across temperate Asia to the Far East. Today's idas has a much larger range in Europe, occurring from S Spain, Calabria and Greece to the N of Norway (but not in Britain) and E across temperate Asia to Altai and Mongolia; its presence in N America has been disputed. Both prefer bushy and grassy places, damp or dry. The name argyrognomon means 'slender perpendicular silver staff,' from Greek argyros = silver and gnomon = pointer of the sundial; idas is a Greek name signifying 'inhabitant of the forest'. In his first paper on the genus Lycaeides (Lep7), Nabokov without qualms used the name argyrognomon for the American species that today is idas. In his next paper (Lep8), he was aware that there was something fundamentally wrong with the name and took three pages to explain why, but as yet did not offer any suggestions what to do about it. The ruling of the International Commission was to come only ten years later. In some American manuals, idas is called argyrognomon to this day, out of sheer neglect. To remind American lepidopterists of the name change that had taken place, Lionel Higgins recounted the reasons for it in an article in the Journal of the Lepidopterists' Society (39 , 1985, p. 145–146). A thorough discussion of the initial error that had led to the confusion is to be found in Francis Hemming's monograph The generic names of the butterflies (London 1967, p. 265–267). "This is," writes Hemming, "probably the most complicated case of a nominal genus based upon a misidentified type-species to be found anywhere in the butterflies." In his notes for "The Butterflies of Europe" (1964), Nabokov says about the distribution of today's argyrognomon: "Its home is certainly Asia, where it attains its greatest size and beauty in Transbaikalia and occurs in a striking number of subspecies in China, N. India and Central Asia. From the Aral Sea and the Volga region it radiates in a westward direction the westernmost points of its distribution being in Norway, Germany, N. and E. France and the Piedmont. It is local in central Europe occurring at low or moderate elevations in Switzerland and Italy (S. to Calabria), Austria and Hungary, Poland, S. Russia and the Northern Balkans. It does not reach S.E. France (beyond Isère), the Pyrenees or Spain but has not yet been recorded from Turkey or Greece. In other words it has not spread westward as far and as densely as idas nor has it produced altitudinal forms and its distribution should be regarded as the second wave of Lycaeides, of a structurally more developed species than the first." Plebejus argyrognomon bergi Kuznetsov, 1906 [Lycaenidae]: a subspecies of Reverdin's Blue from the Aral Sea and Kazakhstan. Plebejus argyrognomon calabricola Verity, 1920 [Lycaenidae]: a subspecies of argyrognomon in Calabria. Plebejus argyrognomon sinica Forster, 1936 [Lycaenidae]: a subspecies described from E Gansu, W China. Plebejus (ex Lycaeides) christophi Staudinger, 1874 [Lycaenidae]: a blue in Turkmenistan, Transcaucasia, Kazakhstan, Himalayas. According to Nabokov, it is a subspecies of today's argyrognomon, Reverdin's Blue. Plebejus (ex Plebulina) emigdionis Grinnell, 1905 [Lycaenidae]: the San Emigdio Blue, in Kern County, California (San Emigdio Canyon). This probably is the butterfly Nabokov was dissecting at the MCZ on June 6, 1944 when he fell sick with food-poisoning, as colorfully described in a letter to Edmund Wilson. Plebejus (ex Lycaeides) iburiensis Butler, 1882, syn ishidae Matsumura, 1929 [Lycaenidae]: a blue in the island of Hokkaido, Japan. Some authors have considered it as a subspecies of »Plebejus subsolanus or of »Plebejus idas. Plebejus ida Grum-Grzhimaylo, 1891, syn kenteana, Staudinger, 1892 [Lycaenidae]: a blue described from Kuku-Noor, Amdo, formerly NE Tibet, now W China. Nabokov suggested it might be the same as 'Lycaeides cleobis kenteana' (= »Plebejus subsolanus). Plebejus (ex Lycaeides) idas Linnaeus, 1761, syn argyrognomon Bergsträsser, 1779 [Lycaenidae]: a Holarctic blue called Northern Blue in America and Idas Blue in Europe. For the change of specific name, see »Plebejus argyrognomon; for the change of generic name, see »Plebejus and »Lycaenidae. The Northern Blue is one of the two Orange-margined Blues of America, the other one being »Lycaeides melissa, the Melissa Blue. The two species are the only N American representatives of the former genus »Lycaeides. They are both of the same size, with a wingspan of 22 to 32 mm. The females of both species are gray-brown, often glossed with blue or grading into blue near the thorax, with a characteristic submarginal band of bright orange lunulae (which is wider in the Melissa Blue) to which they owe their collective common name. The males of the Northern Blue are of an iridescent violet blue, with a narrow black border and a white fringe. The Northern Blue prefers cool zones in western mountains, open areas, heaths and bogs in coniferous or mixed forests. Its range in America is from Alaska to the mid-Californian mountains and to S Colorado. In Eurasia, the range of idas is most of Europe (unlike that of argyrognomon also W and N Europe), Turkey, the Middle East and Asia. Lep7 argues that idas is derived phylogenetically from Lycaeides agnata Staudinger, 1889 of C Asia. In his first scientific paper on lycaenids (Lep7), Nabokov argued that the N American forms of the genus Lycaeides Hübner fall in three main groups, clustering around the species argyrognomon (= idas), scudderi and melissa. In the idas group, there is the subspecies anna and another one with "fawn or whitish fawn underside" that may require a name of its own but has not yet received one. In his ultimate work on the genus (Lep14), Nabokov distinguished ten intergrading subspecies of N American argyrognomon (= idas): a "western array" consisting of anna, lotis and ricei, a "northern or transcontinental array" (alaskensis, scudderi, aster) and a "Rocky Mountains array" (ferniensis, atrapraetextus, longinus, sublivens). Plebejus (ex Lycaeides) idas alaskensis Chermock, 1945 [Lycaenidae]: one of the three northern subspecies of idas, flying in Alaska and N British Columbia. Plebejus (ex Lycaeides) idas anna W.H. Edwards, 1861 [Lycaenidae]: the Anna Blue, flying in N California, S Oregon and W Nevada. It is one of the three western subspecies of idas. Plebejus (ex Lycaeides) idas argulus Frey, 1900 [Lycaenidae]: a valid subspecies of the Idas Blue described from the Simplon Pass and occurring in the High Alps of the canton Valais, Switzerland. It intergrades into the low altitude form »Plebejus idas valesiacus described from Martigny and the high altitude form (up to 2,200 m) »Plebejus idas haefelfingeri described from the vicinity of Zermatt. Dr. Michel Sartori of the Lausanne Zoological Museum who examined and labeled all of Nabokov's captures from 1960 to 1975 ignored valesiacus and argulus, labeling Nabokov's captures from Martigny, Simplon and Zermatt Plebejus idas idas. The authoritative Swiss manual Schmetterlinge und ihre Lebensräume published by Pro Natura (1994) ignored all subspecific names of Swiss idas. So they do not seem to have any taxonomic standing. Plebejus (ex Lycaeides) idas aster W.H. Edwards, 1882 [Lycaenidae]: the Newfoundland Blue, flying in Newfoundland, Quebec and N New Brunswick. It is one of the three northern subspecies of idas. Plebejus (ex Lycaeides) idas atrapraetextus Field, 1939 [Lycaenidae]: the Dark-edged Blue, flying in Idaho, W Montana, E Oregon and SW Washington. It is one of the four Rocky Mountains subspecies of idas. Plebejus idas bellieri Oberthür, 1910, syn corsica Tutt, 1909 [Lycaenidae]: a Corsican and Sardinian subspecies of the Idas Blue. Plebejus (ex Lycaeides) idas calliopis Boisduval, 1832 [Lycaenidae]: a subspecies of the Idas Blue, in SW France (Savoie and Sea Alps), at 500–1,000 m.
Plebejus (ex Lycaeides) idas empetri Freeman, 1938 [Lycaenidae]: the Crowberry Blue, in the Canadian zone of Nova Scotia (Bras d'Or Lake on Cape Breton Island) and Prince Edward Island. Plebejus (ex Lycaeides) idas ferniensis Chermock, 1945 [Lycaenidae]: the Fernie Blue, flying in SE British Columbia and SW Alberta. It is one of the four Rocky Mountains subspecies of Plebejus idas. "One of my favorite spots remains a ravine smothered in flowers, near Fernie, three miles west of Elko, British Columbia, where on a summer day in 1958 I collected specimens of a very local little butterfly (Lycaeides idas ferniensis) which I badly wanted for the Cornell University Museum". Plebejus idas ganssuensis Grum-Grzhimaylo, 1891 [Lycaenidae]: a subspecies (?) of the Idas Blue in the mountains of C Asia (Amdo, Kuku-Noor, described from "montibus Tetungensibus"). Plebejus (ex Lycaeides) idas haefelfingeri Beuret, 1935 [Lycaenidae]: a subspecies of the Idas Blue, described from the Triftbach running through Zermatt and occurring in the Alps of Savoie and Switzerland, at high altitudes up to 2,200 m. It intergrades into the middle altitude form »Plebejus idas argulus described from the Simplon Pass and the low altitude form »Plebejus idas valesiacus described from Martigny in the Rhône valley. Dr. Michel Sartori of the Lausanne Zoological Museum who examined and labeled all of Nabokov's captures from 1960 to 1975 ignored valesiacus and argulus, labeling Nabokov's captures from Martigny, Simplon and Zermatt Plebejus idas idas. The authoritative Swiss manual Schmetterlinge und ihre Lebensräume published by Pro Natura (1994) ignored all subspecific names of Swiss idas. So they do not seem to have any taxonomic standing. Plebejus (ex Lycaeides) idas longinus Nabokov, 1949 [Lycaenidae]: the Longinus Blue, flying in NW Wyoming. It is one of the four Rocky Mountain subspecies of Plebejus idas which Nabokov "fixed" in his definite paper on the genus (»Lep14). The case was less clear than that of sublivens. Only three of the seven specimens were thoroughly typical; the other four were transitions from idas to melissa – "a systematist's nightmare. Nightmares cannot be statistically treated, but they can be very precisely described" (Lep15). See in »Section 1. This probably is the butterfly Nabokov mentions in a letter to Edmund Wilson (May 23–25, 1949): "Around the 20th of June we shall start driving westwards – … to Teton Nat[ional] Forest, Wyo[ming], to look for a butterfly which I have described, named, fondled – but never actually taken myself." According to Brian Boyd (VNAY 142), Nabokov was lucky, catching "some fine long series of the insect". Plebejus (ex Lycaeides) idas lotis Lintner, 1878 [Lycaenidae]: the Lotis Blue, restricted to Mendocino County in N California. It is one of the three western subspecies of Plebejus idas. While Nabokov had classed this butterfly as a subspecies of scudderi W.H. Edwards in Lep7, he came to consider all of scudderi as a mere Northern subspecies of idas. In consequence, scudderi lotis became idas lotis. Plebejus (ex Lycaeides) idas nabokovi Masters, 1972 [Lycaenidae]: Nabokov's Blue2, a subspecies of the Northern Blue, in Minnesota. See in Sections »1.2 and »1.4. Plebejus (ex Lycaeides) idas rauraca Beuret, 1928 [Lycaenidae]: a subspecies in N Switzerland, "inconsequentially named" by Beuret and taxonomically without standing. Plebejus (ex Lycaeides) idas ricei Cross, 1937 [Lycaenidae]: Rice's Blue, flying from British Columbia through Washington to S Oregon. It is one of the three western subspecies of Plebejus idas. Plebejus (ex Lycaeides) idas scudderi W.H. Edwards, 1861 [Lycaenidae]: Scudder's Blue, flying in Alberta, Saskatchewan, S Manitoba, Minnesota, E Quebec and Labrador. In his first technical paper on lycaenids (Lep7), Nabokov had argued that the N American members of the genus Lycaeides fall in three main groups, one of them being the one that clusters around Lycaeides scudderi, namely the subspecies Lycaeides scudderi scudderi W.H. Edwards, 1861 and Lycaeides scudderi lotis Lintner 1878. In his definite paper on the genus (Lep14), Nabokov classed scudderi as one of the three northern subspecies of idas. Plebejus (ex Lycaeides) idas singularis Heyde­mann, 1932 [Lycaenidae]: According to Nabokov, this is a W European subspecies of idas akin to the N American »Plebejus idas anna. Plebejus (ex Lycaeides) idas sublivens Nabokov, 1949 [Lycaenidae]: the Dark Blue, also called "Nabokov's Blue1", flying in Colorado (San Miguel, San Juan and Elk Mountains). At first Nabokov had thought it was a species; later he came to consider it one of the four Rocky Mountain subspecies of Plebejus idas. See also »Section 1. Plebejus (ex Lycaeides) idas valesiacus Oberthür [Lycaenidae]: a form of the Idas Blue described from Martigny and occurring in the upper Rhône valley, canton Valais, Switzerland. It intergrades into the middle altitude form »Plebejus idas argulus described from the Simplon Pass and the high altitude form (up to 2,200 m) »Plebejus idas haefelfingeri, described from the vicinity of Zermatt. Dr. Michel Sartori of the Lausanne Zoological Museum who examined and labeled all of Nabokov's captures from 1960 to 1975 ignored valesiacus and argulus, labeling Nabokov's captures from Martigny, Simplon and Zermatt Plebejus idas idas. The authoritative Swiss manual Schmetterlinge und ihre Lebensräume published by Pro Natura (1994) ignored all subspecific names of Swiss idas. So they do not seem to have any taxonomic standing. Plebejus (ex Lycaeides) idas yarigadakeana Matsumura, 1929 [Lycaenidae]: a Japanese subspecies of the Idas Blue, described from Nikko (Honshu). Plebejus (ex Lycaeides) melissa W.H. Edwards, 1873 [Lycaenidae]: the Melissa Blue is one of the two Orange-margined Blues of N America. The other one is »Plebejus idas, the Northern Blue. They are both of the same size, with a wingspan of 22 to 32 mm. The females of both species are gray-brown, often glossed with blue or grading into blue near the thorax, with a characteristic submarginal band of bright orange lunulae (which is wider in the Melissa Blue) to which they owe their collective common name. The males of the Melissa Blue are lilac, silvery blue or dark blue, with a narrow black border and a white fringe. The Melissa Blue swarms over open sunny areas, especially alfalfa fields and dry mountain meadows; its range is from Mid-Canada through the Rocky Mountains to Mexico and east through the Great Plains to New Hamphire. In his first scientific paper on lycaenids (Lep7), Nabokov argued that the N American members of the genus Lycaeides fall in three main groups, one of them being the one that clusters around the species melissa, with three intergrading subspecies: melissa melissa W.H. Edwards, 1873, melissa annetta W.H. Edwards, 1882 and melissa samuelis Nabokov. In Lep14 (p. 482), he added one more, inyoensis Nabokov 1949. In his first paper on the genus Lycaeides (Lep7), Nabokov mentioned that the distribution of this American species reaches as far east as Labrador but that it miraculously had also been reported from the Lower Volga, under the name sareptensis Chapman, 1917. Like Stempffer, Nabokov doubted whether the locality information on sareptensis was accurate, adding however that Forster in 1936 had reported it from Kamchatka, and that looks "fairly plausible". In his third paper on Lycaeides (1949), Nabokov cancelled Kamchatka, explaining it had merely been an unsubstantiated locality in Staudinger's catalogue of 1901. As to Sarepta on the Lower Volga, he deferred the question if there is a Russian melissa until Chapman's material would be reexamined. Zsolt Bálint has examined Chapman's specimens and found them to be »Plebejus idas whose presence in the region of Sarepta had never been in doubt (personal communication and "Annotated list of type specimens of Polyommatus sensu Eliot of the Natural History Museum, London (Lepidoptera, Lycaenidae)", Neue entomologische Nachrichten [Marktleuthen], 46, November 1999, p. 1–89). So there was no biogeographical miracle involved. Plebejus (ex Lycaeides) melissa annetta W.H. Edwards, 1882 [Lycaenidae]: the Annetta Blue, in the Wasatch Mountains of NC Utah. It is one of the five subspecies of the Melissa Blue. Plebejus (ex Lycaeides) melissa inyoensis Gunder, 1927 (Nabokov, 1949) [Lycaenidae]: the Inyo Blue, from Lake Mono to S California. This subspecies of the Melissa Blue was formerly considered to be just an aberration of melissa. Nabokov's choice of name proved untenable. Today the name is Plebejus melissa paradoxa Chermock, 1945. For more on this butterfly, see in »Section 1. Plebejus (ex Lycaeides) melissa melissa W.H. Edwards, 1873 [Lycaenidae]: the nominate subspecies of the Melissa Blue. The type locality is Park county, Colorado. Plebejus (ex Lycaeides) melissa pseudosamuelis Nabokov, 1949 [Lycaenidae]: a high altitude subspecies of the Melissa Blue in Colorado, one of the five subspecies that Nabokov "fixed" in Lep14. It proved to be the same as »Plebejus melissa melissa and hence is defunct. See in »Section 1. Plebejus (ex Lycaeides) melissa samuelis Nabokov, 1943 [Lycaenidae]: the Karner Blue, an endangered butterfly people are campaigning to save and more on which will be found in »Section 1. It is one of the five subspecies of the Melissa Blue. In the literature, it was sometimes confused with Plebejus idas scudderi (Lep14 503). Since 2011, it is not a subspecies of melissa any more, but a species in its own right. Plebejus pylaon trappi Verity, 1927, syn lycidas Trapp, 1863 [Lycaenidae]: a subspecies of the Zephyr Blue (Plebejus pylaon Frivaldsky, 1835) described from the Simplon Pass, occurring between 1,000 and 2,000 m in Savoie, S Switzerland and in the Italian Alps. Some authors consider trappi a distinct species (Plebejus trappi). Plebejus saepiolus Boisduval, 1852 [Lycaenidae]: the Greenish (Clover) Blue, in the mountains from Alaska to Colorado and S California. Plebejus saepiolus amica W.H. Edwards, 1863, syn kodiak W.H. Edwards, 1870 [Lycaenidae]: the Amica or Kodiak Blue, a subspecies of the Greenish Blue, in Alaska. (Plebejus) scudderi doei Roe [Lycaenidae]: a joke in an otherwise highly technical paper. This butterfly is one of two subspecies invented by Nabokov to show how nice it would be if one were able to distinguish clearly between different intermediate forms and to draw a line between them, sorting A into one species and B into another. The subspecies on the other side of the cline he called melissa roei Doe. They would be mirror-like to each other, one of them pending towards scudderi, the other towards melissa. Of course, there is neither a Roe nor a Doe. Plebejus (ex Lycaeides) subsolanus Eversmann, 1851, syn cleobis Bremer, 1861 [Lycaenidae]: a blue in the foothills of E Sayan, Pribaikalye, E and S Siberia, N Mongolia, Amur region, Japan. The type locality is Irkutsk. In Nabokov's first technical paper on the genus Lycaeides (Lep7), there is a footnote suggesting that Eversmann's type of subsolanus should be reexamined because "his lucid description (grotesquely mistranslated by Rühl and thus copied by Seitz) seems to me to fit quite exactly the species known as cleobis Bremer". There is also a taxon called "cleobis kenteana Staudinger, 1892, (?ida Grum Grshmaïlo, 1891)" with the footnote, "I question the accepted identity of kenteana Staudinger with Grum Grshmaïlo's ida from Amdo". Both remarks point to a whole knot of classificatory problems. The hunch Nabokov expressed in the first footnote has been born out, and cleobis today is considered the same as subsolanus. Being the older name, subsolanus has precedence. The other footnote questioning the identity of kenteana and ida has not gained acceptance; »Plebejus ida is still a valid species and kenteana a synonym for it (Zsolt Bálint, personal communication). During his laboratory work on the American Lycaeides species, Nabokov noted that "the very slight but absolutely constant difference in the male structure, between the American scudderi and the Asiatic cleobis [= subsolanus] forms although negligible from the point of view adopted here for the seperation of species is still an obvious fact and anyone applying another method than mine (or perfecting that method) is perfectly entitled to regard subsolanus and scudderi as different species". That is, according to his own criteria, Nabokov tended to consider subsolanus and scudderi as conspecific. The same striking structural similarity probably is what made him remark, in a letter to Edmund Wilson (January 12, 1943), that "an unnamed subspecies of cleobis Brem. [= subsolanus], a Siberian butterfly, is distributed through Saskatchewan, Alberta, Idaho, Wyoming and Colorado". He was speaking of »Plebejus idas scudderi. In the first technical paper that came out of his work on Lycaeides (Lep7), Nabokov confirmed the genitalic similarities between scudderi and argyrognomon [= idas]. "Not only are they inseparable by the shuttling external characters, but all the examples look as if they belonged on the whole to one 'arctic' race of one and the same species. Here we put our finger on something very like the actual evolution of scudderi from argyrognomon [= idas]". He added that he had discovered an analogical case in the Palearctic "where cleobis kenteana Staudinger, 1892 [= subsolanus]… is linked up with a most interesting (undescribed) 'black' form of argyrognomon [= idas] from North-Eastern Asia …". They "are, except for a more robust build in the cleobis [= subsolanus] organ, practically identical in genitalic structure, but either have not been in touch for a longer time or are coincident species i.e., separately evolved from initial argyrognomon [= idas]-like structures". In his last paper on Lycaeides (1949), Nabokov made kenteana a subspecies of argyrognomon [= idas], again suggesting the close relationship between idas, subsolanus and ida. Plebejus (ex Maurus) vogelii OBERTHÜR, 1920 [Lycaenidae]: a "heavenly" blue of the Polyommatus kind occuring very locally in the High Atlas of Morocco. Plebulina Nabokov, 1944: a genus of Lycaenidae, subfamily Polyommatinae (blues), designated by Nabokov (see »Section 1). In 1997, the genus was included in the genus Plebejus Kluk 1802 where its only member (»Plebejus emigdionis) will be found; for details on this transfer, see under »Lycaenidae and »Polyommatus Section. Plusia Ochsenheimer, 1816: a genus of »Noctuidae (owlet moths), subfamily Plusiinae, with characteristic metallic (mostly golden or silver) patches or letter-like marks on the wings. Most of its former members have been transferred to other genera, mainly Autographa and Autoplusia. The type-species is Plusia festucae Linnaeus, 1758, the Gold Spot, in Europe. Plusia rosanovi: This probably is an invented salt-marsh owlet moth with a real generic name (in Noctuidae, subfamily Plusiinae]. There does not seem to exist a species by this name. If rosanovi should be a misprint for romanovi, it would be a moth dedicated to Grand Duke »Romanoff, the sponsor of Grum-Grzhimaylo's expeditions to C Asia.